Do wasps build nests inside houses? Jump Menu: Do wasps build nests inside houses? Do I need to have a wasp nest removed? Do wasps nest underground? 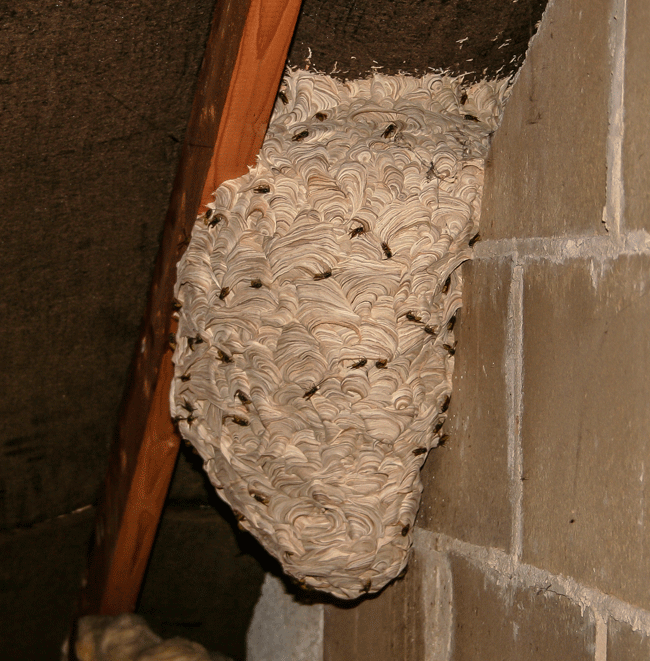 Why do wasps nest in lofts? Can I destroy a wasp nest myself? Below are some frequently asked questions and answers, we will continue to expand this part of the website over time. The titles to each question link to more information contained on other pages of the site. Wasps often build their nests inside houses, sheds, garages and just about anywhere that is dry, warm and where they have constant access. Due to their size, wasps can gain access through the smallest of openings. Loft spaces are prefered simply due to easy access and area which a loft provides. Roof rafters provide good anchor points to start a nest, and the environment is warm, dark and relatively undisturbed. Wasps can also nest in the cavity of walls if there is access. Wasps can utilise most spaces and can build their nests to fill any shape. Do I need to have a wasp nest removed? In general, it is better not to remove a wasp nest after treatment. After treating the wasps within a nest, the nest is now nothing more than a piece of chewed wood and is harmless. Wasps only use a nest for one season. Leaving the nest in situ will prevent other wasps from rebuilding a new nest in this valuable nesting space. Old nests usually remain in place and unused for many years before they eventually fall off and disintegrate. We do not remove wasp nests as the treatment takes some hours to work. We treat the nest and then leave it to die. Once the nest is dead, it's finished and will never be reused, so there is no need to remove it. If you have a nest and you are unsure if it is active, there are some questions which need answering. What time of year is it when you found the nest? If it is summer time, it is possible that it could be active. If it is late winter, it is probably dead. If it is spring, how big is the nest? New nests in spring will be the size of a golf ball and no more significant than an orange. Can you see any activity on or around the nest? An active, healthy nest will have wasps walking over the outside of the nest all the time. 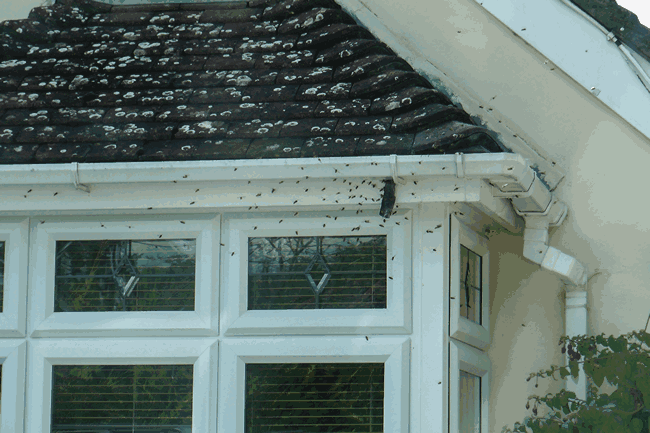 There will also be a constant stream of wasps leaving and arriving at the nest. Can you hear anything? Wasps are quite noisy, and the nest will make a humming noise, also scratching and popping sounds can be heard coming from some nests. If you are sure the nest is dead and you want to get rid of it, the best time is late winter when you can be sure it has finished. Also if you have the nest treated to kill it, we recommend that you leave the nest for a day or two after treatment to allow all the wasps to get home from foraging, so they come into contact with the insecticide. If you need to remove a wasp nest, once you have determined that the nest is old and dead, you can safely remove it if need be. The safest time to remove a nest is either after the nest is treated and the wasps are all dead or if the nest has not been treated and you are unsure of the history of the nest, wait until late winter. We suggest wrapping a bin liner around as much of the nest as you can, then pull the nest into the bag. Wasp nests are very fragile and will crumble very easily. It is common for wasps to nest in the ground. Wasps will take over old vole, mouse or rabbit burrows where they build a nest. Wasps will excavate the soil around a nest to expand the area underground for nest building; they will carry dirt out of the nest site and deposit it away from the area. You can quickly identify a wasp nest in the ground by merely watching the activity. Wasps nesting underground generally have one or two entrances, and as the nest gets bigger with more individuals, the traffic to and from the nest will increase. Eventually, the wasps will be queuing up at the entrance holes to enter and leave. There is a type of bee called a mining bee that burrows into the ground. There are several different types of mining bee in various colours and shades. Mining bees have no sting and are harmless; they only stay for a few weeks then leave. They do not need any treatment. 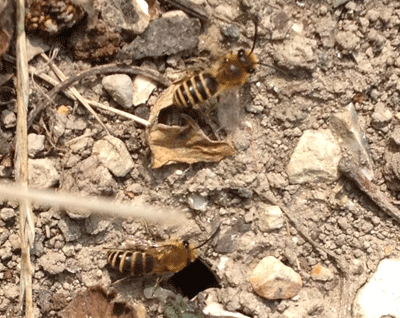 You will see mining bees in the spring, and you will also see Ivy bees (a type of mining bee) in late summer. Mining bees excavate individual holes which resemble large wormholes. Mining bees are beneficial insects which are harmless and cannot sting. Although uncommon, hornets can and do nest underground. Hornets will take over a disused rabbit burrow or mouse hole and build their nest in a subterranean void which they will excavate if need be. Hornets are more likely to nest in voids in old trees or lofts as they require a reasonably large space in which to build their nest. Some species of bee also nest underground in the same way, noticeably bumblebees. Bumblebees are black large and fluffy; the most common type is whitetail bumble bees (they have a white bum). If you have bees entering a single hole in the ground, it will most likely be bumble bees. If you have lots of small holes with bees entering them, it will be mining bees. In either case, they should be left alone if possible. We do not treat any bees. Why do wasps nest in lofts? Wasps nest in lofts for several reasons, the first is because in general attics are quiet places that are undisturbed most of the time. 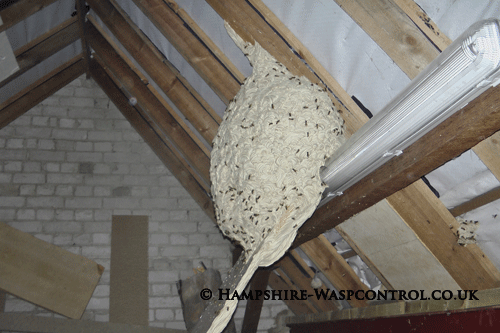 An attic in summer is usually hot; this is ideal for wasps to nest in as the added heat helps keep the young wasp larvae warm. Lofts provide ample space with many areas which are suitable nest sites. There are many wooden structures which are ideal starting points for nest building. However, wasps usually never chew wood from lofts for nest building material. They can chew the surrounding area of the nest to provide more space for nest expansion. Can I destroy a wasp nest myself? There are various products available for DIY wasp treatments. We have often been called out to finish off a nest after the use of one or more of these products. Due to DIY wasp treatments frequently failing and the problems this causes when trying to deal with a nest after a failed attempt. Now we ask if you have decided to kill the nest yourself, please do not call us afterwards. We are in the business of wasp nest treatments, so of course, we will advise you to have a professional attend and destroy your nest. However, there are some facts that you can research for yourself regarding the dangers of wasp attacks. We do not charge extortionate prices, and we are indeed cheaper than your local council.